I believe the Memorial, and the discussion and excitement it generated, helped to set a tone for this Convention. This is the third Convention I have attended as a deputy, and in contrast to the other two, I saw far more focus on Jesus’ call to proclaim the good news this time, and far less focus on conflict…I think is safe to say that Episcopal Resurrection had a measurable effect on Convention this year. To me, that fact goes to show that our polity in the Episcopal Church truly is democratic. A determined minority of folks who capture others’ attention and imagination can influence the course of the church. We had no church-wide funding (we paid ourselves for our plane tickets to Columbus, our advertising on social media, our buttons and cards, and our meeting rooms for our two gatherings at Convention). We had no official authorization to do the work we did. But we were deputies to Convention, we made proposals, and we made a difference. The Memorial: Was commended to Convention, and all bishops and deputies were urged to share it with their communities and congregations, in resolution A179. I believe the Memorial had an effect far beyond A179, however; it helped set the tone for a Convention that would vote to include evangelism initiatives in the budget. D005: Creating a Capacity to Plant Churches: This is a very bold and strategic initiative, not only to provide grants for church planting, but also to train church planting leaders, including lay and ordained leaders for Latino/Hispanic church plants. This initiative passed with enthusiastic support in both houses – the House of Bishops reportedly broke into applause when it passed. It was NOT funded in PB&F’s proposed budget, but with some legislative work, our Episcopal Resurrection group managed to propose and get passed a $2.8 million addition to the budget that will help fund D005 and also A086, a resolution on Latino/Hispanic ministries. In addition, the Development Office is asked to raise money for this initiative. D009: Revitalization of Congregations: This resolution also passed both houses with wide support, but it received no funding. However, the resolution still calls on the Development Office to raise money to fund this initiative, so it may yet see the light of day. B009: Conducting an Online Digital Evangelism Test: This resolution passed with wide support, especially on The Twitters. It also received significant funding. Watch for the Episcopal Church to start developing a much stronger social media presence, including ways to connect with people who are searching online for answers to life’s questions, and helping connect them with local communities of faith. D007: Permit Dioceses to Explore Shared Ministry and Collaboration: Passed. This resolution loosens up the requirements for dioceses to have separate Commissions on Ministry so that they can explore ways of sharing resources. Our original resolution allowed a diocesan bishop to reside outside his/her diocese if the bishop living in another diocese where he/she also serves, but this provision was struck. D003: Amend Article V of the Constitution: Passed. This is the first reading of a constitutional amendment, which must be approved at two consecutive General Conventions to become effective. This provision allows two dioceses to merge when one is without a diocesan bishop – the precise time that may be most attractive for a merger. D004: Create a Task Force to Study Episcopal Elections: Passed. Apparently there was some anxiety in some places about whether this task force would impose church-approved candidates on dioceses. That was certainly not our intent. While the hope for more diversity in the House of Bishops was the part of this resolution that received the most attention, we also hoped that a set of best practices would be created that would be electronically available, to help bishop search processes become more transparent. The next question is whether the funding allocated to this task force by Executive Council (out of Convention’s total budget for CCABs) will be adequate to the task. D008: Amend Article I, Section 1 of the Constitution: Passed. This is the first reading of a constitutional change. If passed on the second reading, it would allow the two houses of General Convention to hold joint sessions and deliberate and vote together. While TREC proposed an immediate move to a unicameral Convention, this intermediate step allows us more flexibility to experiment with joint sessions and see how we like them. D013: Budget Process for the Episcopal Church: Passed with some significant modifications. Our proposal clarified the budget process so the canons conform to actual practice (we haven’t actually followed our canons on the budget in years). We made the diocesan “asking” into a mandatory assessment, with waivers to be granted by Executive Council for dioceses that cannot pay the full amount; this provision becomes effective in 2019. Thank God for this change, which I believe will contribute greatly to the spiritual health of the church, as all dioceses participate equally in paying their fair share. My hope is that the assessment could even fall below 15% as this provision takes effect. The most significant change to our original resolution was that we proposed that the President of the House of Deputies should receive a salary, a proposal that seemed self-evident to us since it is a full-time, unpaid position. Keeping it as an unpaid position means that only independently wealthy or retired people can serve, and as the Bible says, the laborer deserves her/his pay. However, this provision caused significant controversy in the House of Bishops, which reportedly complained about the increasing scope of the PHoD position (apparently without irony, given the corresponding increasing scope of the Presiding Bishop position). This sniping at the PHoD by the bishops seemed petty and mean-spirited to many deputies. The people in the purple shirts would not dream of working for no pay – why would they demand it of others? In the end, after significant work by a conference committee (the first since 1997), the two houses compromised on this issue by agreeing to form a task force to explore issues of leadership and compensation for the PHoD. The whole conflict seemed indicative of the deep divide that has opened between bishops and deputies over the last several years. I hope that over the next three years, reconciliation will come, and the full scope of the PHoD’s position will be recognized and honored. And I certainly hope that we can build trust and work together productively – after all, in God’s kingdom, we are all on the same team. D010: Clarify Officers of the Episcopal Church: Discharged, but some provisions from this proposal were folded into A004, which clarified the roles of the Presiding Officers, Executive Council, and staff. 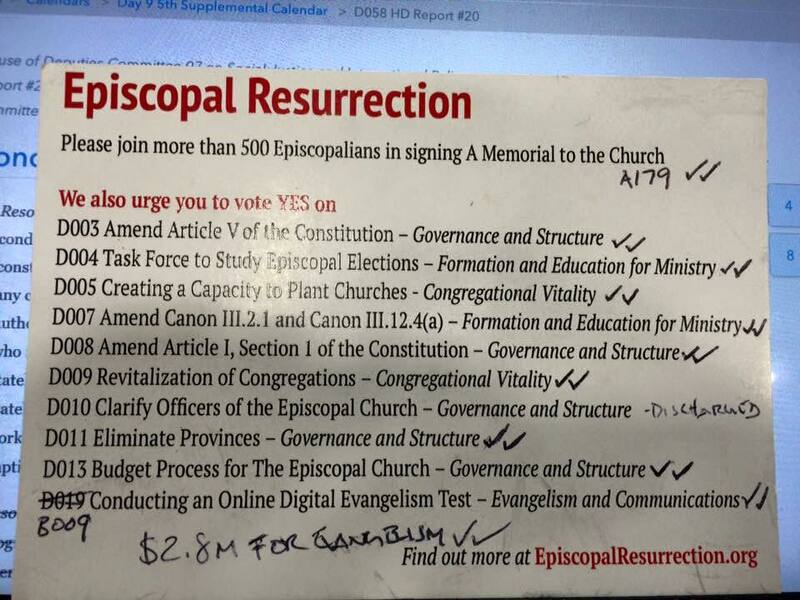 One of Episcopal Resurrection’s contributions to A004 was to propose the position of Chief Legal Officer. Resolution A004 was the subject of some intense debate and compromise, but in the end, it passed both houses. D011: Eliminate Provinces: Substitute resolution passed. Our original resolution, which would have eliminated provinces altogether, was re-written to establish a task force to study provinces and report back to the next General Convention with ideas for what might take their place if they were eliminated. On the Governance & Structure committee, on which I served, testimony on the provinces resolution clearly fell along age lines. Older folks testified to the meaningful contributions of provinces and the networks they support; younger folks wondered why networks should be organized geographically and involve required governance structures, when electronic communications make organizing along interest lines much easier. As I listened to the testimony, it became evident to me that though the time for eliminating provinces may not be now, that time is coming. And the networks we form in the future will be right for that time, just as the Provinces were the right networks for their time. Overall Episcopal Resurrection scorecard: 6 resolutions passed essentially unchanged; 2 resolutions passed with modifications; one resolution discharged, but with significant provisions combined into another resolution; one resolution caused intense conversation and was referred to a study committee. One Memorial changed the conversation around the church. A pretty good record, overall.